What are you most thankful for? Many people start with being thankful for life, relationships, children, and/or jobs. But what can believers be thankful for when persecution threatens life, marriages break up, children become prodigals, unemployment looms, or food becomes rationed? If you are a believer in the Lord Jesus Christ, you can be thankful even in times of distress no matter who you are, where you live, or what you do in life. “In him we were also chosen, having been predestined according to the plan of him who works out everything in conformity with the purpose of his will” (Ephesians 1:11). Have you ever been the first person chosen to be on a team? When you’re picked first there’s a sense of achievement and respect that you bring along. God chose you out of your sinful lifestyle and gave purpose to your life. Thank God today that you were chosen to receive the forgiveness of sins and a place among those called by Him. Through the Holy Spirit, there’s an assurance of the peace of God in any storm. Thank God today that you can have peace in the midst of great stress and trials. Storms will come whether in the form of an illness, persecution, financial distress, family problems or in other situations. Sooner or later your faith will be tested and you will need peace that transcends understanding. This peace is available to all believers. 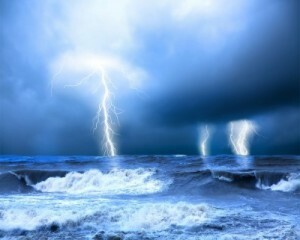 Through the Holy Spirit, there’s an assurance of the peace of God in any storm. Thank God today that you can have peace in the midst of great stress and trials. It’s a spiritual puzzle you may never understand in this lifetime. God knows how to put together key moments of time, people, and situations to work out the best interests of those who love Him. God can turn the worst possible situations for His glory and your best outcome. Thank God today that He is working every puzzle piece of your life for your good. It’s distressing to know that many people live without really feeling loved when God loves them with an unconditional love. You’re so loved by God that He sent His one and only Son, Jesus Christ to take the penalty for your sins. There is nothing you can do to make Him love you more or less. Thank God today for the abundant love that He shows you every day. Isn’t it amazing that in spite of all the activity in the world…the Creator listens to you? People clamor to be in the presence of politicians and famous individuals, but how much greater it is to have entrance into the throne room of God at any time. It’s a privilege that’s easy to take for granted. Thank God today for the awesome greatness of being heard from the Most High Father in heaven. We have the presence of God at all times whether we sense it or not. Through the Holy Spirit, every believer can have continual contact with God at all times. There’s nothing ever hidden from His eyes. Even in the darkest hours when all seems lost—He’s there. Thank God today that you are never alone in Him. “But our citizenship is in heaven” (Philippians 3:20). The trials of life often remind us that we have a heavenly dwelling with no sorrow, tears, or hardship. It’s a place of eternal joy, peace, and love. Our joyful expectation is to be reunited with loved ones and, most of all, to see Jesus as He is and worship Him in the presence of the angels. Thank God today for your heavenly home after your time on this earth. When we are in a season of suffering, it may be difficult to be thankful. By the grace of God, your eyes can be opened to always find something to thank Him for. Take the thankfulness challenge and choose one of the list above for each day of the week. Do it for a month to see how your outlook on life becomes more positive every day. Wonderful.We should be thankful that all things work together for our good.A big amen!!! Thanks so much for your words of encouragement Charmant. Have a blessed day! Terrific article with Scripture! We all need ‘reminders’ to THANK FATHER GOD!! Since re-reading & studying God’s Word every day since 2012 (or late 2011, at my age, “the mind is the first to go~!” LOL!) my heart, mind and spirit have been filled with sooo much JOY and PEACE!! Blessings I can’t begin to describe, Crystal! So far, beautifully GOOD! PRAISE FATHER GOD, HIS SON, JESUS, HIS HOLY SPIRIT!!! AMEN! Oodles of God’s blessings upon you, Crystal, and your ‘small’ family!! It’s so good to know that things are well with your son moving back home. One more thing to add to our thankfulness list! God bless! Thank you Madam for sharing this wonderful collections of God’s Word. More blessings be on you! Really love your articles…so helpful! Are you going to do a bible study anytime in the future? Right now I am again struggling to find a church where I fit in. Just don’t fit in the mega church. Grew up in church of 250-350. Have been trying again. Dear Susie, you have much to offer the body of Christ…I hope you will search diligently for the right ministry in which God can use your gifts for the kingdom of Christ. Great article, Crystal. Thanks for sharing it. Right now at this time in my life most people wouldn’t be so thankful. Let me tell you, I am even thankful for the bad things that happened to me as a child. Not sure why, but the Lord has always been there for me through every one. Even before I got saved 14 years ago. I guess it strengthens my faith in him, knowing he has always been there for me…. Thanks for the article, I need encouragement as of late. Have a blessed day! I pray your heart continues to be encouraged towards thankfulness even in difficulty. Nancy, that is so true about God being there even before we come to know Him. I was saved when I was 14 but when I look back, Jesus was there guiding us and protecting us into the Truth.